I know, I know, its not ALLMOST finished. Without engine management and trim its more like an arcade game with a serious flight model. Nowhere near the white knuckle effect of our beloved 1946. However, after months of wait and see I think the eye candy justifies a ride once in a while. I did my first 8vs8 last night. It was not very exciting(will try the Aces tonight) but it was a spectacular sky. 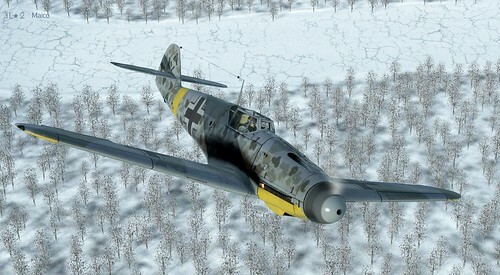 Is it just me or is this the best looking 109 in a game? The evening sky is something to behold. Weather effects and shadows beyond belief. Its as good or better than DCS. Just sharing. Have a good day. That 109 sure does look cool Maico. To bad the fm feels like soap box race cars. But it it's beautiful, in every way you can't take away from it there. The 109 already has all the trim it needs as it's an F-type which had the horizontal stabiliser instead of regular elevator trim. That is the only pilot adjustable control there was but it still may not feel right as the FM is still in development. I fly the VVS and the Lagg-3 is waiting for all 3 trim controls to work so imagine how that feels. 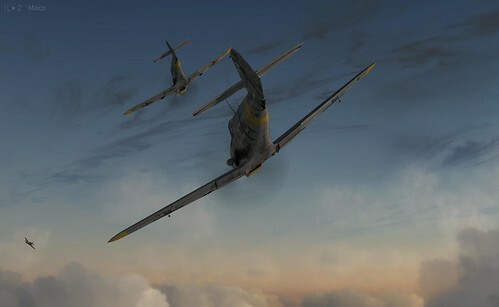 The Lagg-3 may be a wooden shed but wait till we have the Lagg-5, that'll be a match for any of the Messers. I think it is coming along gradually, slower than originally advertised but what's new there in the flight sim world, and shows great promise. Ground handling is much better than in CloD and I am sure the flight modelling will be top notch too eventually. WHoleheartedly agree^^^^ Mad Dog!! Ohh and Mad Dog that avatar of yours scares the crap outta me for some reason!!! I wouldn't want to see a dog like that in a dark alley...... on his turf!!! !